Vipassana means to see things as they really are. The meditation technique is one of India’s most ancient forms of meditation. During meal times over the 10 day course, I would look around the room and contemplate the universality of what we, the 65 women who were there together, were simultaneously experiencing. I would also imagine the inner workings of the mind’s of the 65 men who sat in the adjacent room, eating in silence, separated from us women and within a context of their own gender norms. There was the girl who would eat three bananas, squish them with her fork, cover them in molasses and sugar and devour her concoction within three minutes and 5 breaths. There was the Russian lady who always wore long dresses and uttered a silent prayer with her hands hovering over her food at every meal time, blessing the food that was given to her and not paying attention to the agreement we all made to not recite mantras or any form of prayer during the 10 day course. There were the identical twins (who I hadn’t even noticed until day 5) who sat across from each other, did not engage in eye contact or speech, but would have an implicit form of intuitive communication which was evident by the simple fact that when one got up for tea or a helping of seconds, she would bring back the same for her sister. There was the lady who couldn’t resist non-verbal communication – when there were no knives left, for instance, instead of going to the washing bins and taking a washed knife, she would come to a table and sign language with someone asking if she can use their knife. She then would signal thank you by drawing her hands to her chest in prayer position and bowing. She also did this anytime you would open a door for her. It was hard to resist the acknowledgement of her thank you given the expectation of no communication among co-meditators whatsoever. There was the pregnant woman who left after day 2. There was the other pregnant woman who made it through. The one who made it through would walk to a window after meal time – a window that looked onto the men’s dining hall and wave to her partner who would have also planned to “meet” her there to say hi each day. There was the girl who would eat some of her meals with fork in one hand and chop sticks in the other and alternate between the right handed fork and left handed chop sticks as she drew big heaps of food into her mouth. She also wore the same shirt every day of the course. There were women ranging from approximately 17 or 18 years old all the way to women in their 70s and 80s. We were women representing every social class, various cultural backgrounds and religions, and the differences and similarities in our activities and interests was simply non-visible but very imaginable. There were the women I wanted to connect with and the ones I was simply intrigued by. Yet, we were all there together, sharing this experience and examining the universal truths related to our human lives, our patterns of aversion and craving, and observing ourselves and others with a learned sense of objectivity. We were all there with the common purpose of learning the Vipassana technique. There’s the expression “different strokes for different folks”. I love experiences like the Vipassana course where you get to share a common experience with people whom you likely wouldn’t otherwise ever meet. Mastering the human mind and techniques such as this engage different folks in learning a same and universal stroke. I have never felt lighter than I did on that drive home. 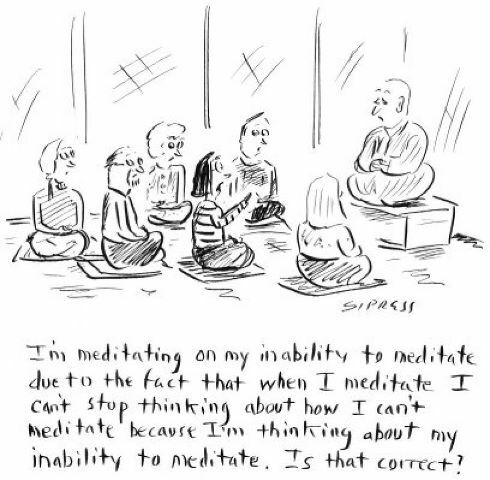 One of the kids at work yesterday asked me “can we meditate?” to which I replied “of course we can. How about right now?”. He said “now?”. Yes, now. All three teenagers in the room eagerly sat up straight and followed the instructions without an word of resistance to the idea of learning how to understand and control their own minds.